Ms Burrowes and Kevin were in early this morning to set up our Spooky WoW yard for all the boys and girls at Scoil Áine. We had a few helpers in the form of skulls, skeletons and spiders. What do you think? Thankfully we had Officer Kevin from the NYPD to keep an eye on things in case any of our helpers got out of hand! We are delighted to be starting our new Green School Theme ‘Biodiversity’ this year and look forward to your help in becoming more Biodiversity Aware at Scoil Áine Naofa. The pupils will be completing a Biodiversity Awareness Survey in class and we would like to offer any parents, who would like to, the chance to take part too. Please can you download the survey at www.scoilaine.com and return it to your child's class teacher when you have finished it. Our Spooky WoW day will take place on Thursday morning Oct 25th and we look forward to welcoming all the pupils on yard in fancy dress for Halloween. The committee would like to encourage everyone to create a costume over purchasing new costumes, where possible. As usual we will have a prize for the best recycled costume in each year group and this will be announced at the Halloween Assembly. Don’t be mean, keep it clean and we’ll go green!! In addition to creating a motto for Mushy we also created our Green- School Code which will help us maintain our litter and waste management around the school. Bring home any food waste & non recyclable packaging to be disposed of responsibly at home. Re-use drinks bottles where possible. The big green bins on the yard are for recycled goods only. Please use both sides of photocopied paper for art or other class activities. Replace cling film and tin foil with paper towels if at all possible. Every day we live the dream. That the world will turn green. Scoil Aine Naofa’s getting there. Showing the way to a greener earth. Paper, stamps and all we use. 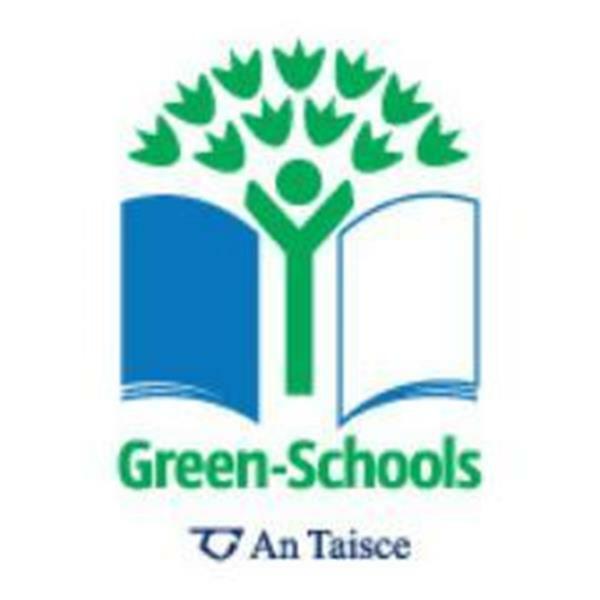 Scoil Aine Naofa’s going green. Ná bí gránna coiméad glan é agus beigh muid glas. Don’t be mean, keep it clean and we’ll go green.